The centre-left of British politics was left reeling and in despair as their last, best hope for their cause was knocked out of Strictly Come Dancing. Plucky, stout former Member of Parliament, Ed Balls was voted off the show this weekend to cap off a miserable year which included electoral defeats in the EU Referendum, the U.S. Presidential election, the re-election of Jeremy Corbyn as Labour leader, the rise of Momentum and the death of Fidel Castro. 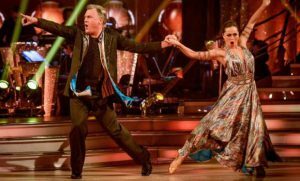 Balls’ determined dancing skills were held up as proof positive that the British electorate hadn’t completely turned their backs on social democratic and liberal politics but now, with being voted off the hit BBC show it seems that there will be no happy note for the Left to end 2016 on. At a gathering of prominent centre-left activists in a trendy Kensington wine bar discussion soon began as to why Balls lost and what it means for moderate socialism in general. “Maybe Ed’s dancing skills were too one dimensional, too uninspiring….” McCarthy and many of the others at the meeting speculated. “Maybe we’ve all just lost our way; we’ve latched onto ideas that just drive voters away whether it’s identity politics, intervening in other countries internal disputes, failing to insist on real reforms of the EU, massively overspending public funds, supressing discussion on immigration or relying on experts rather than listening to the concerns of the public and maybe Ed Ball’s cha-cha-cha isn’t winning voters to Labour…..maybe it’s us who need to take a good, long, thoughtful look at our ideas and boogie moves and be prepared to change” At that moment, there was a pause amongst those gathered as they pondered that concept. The meeting finally broke up at 2am when it was announced that Labour had slipped another 2 polling points behind UKIP.